As the APN team prepares to tackle our first Dungeons & Dragons adventure, Rage of Demons: Out of the Abyss, I am faced with the trials and tribulations of the Dungeon Master. I have to weave backstories into the module, prepare stat blocks, and make sure I have the physical tools I need to represent our game in physical space. As someone who spends a lot of time playing Tabletop RPG's on both sides of the DM screen, I've become keenly aware of my strengths and weaknesses. While I'm totally comfortable performing an eternally evolving spectrum of personalities, a lot of the tools I've amassed over the years are to triage my struggle to run smooth combat encounters. I'm pretty sure that this means that I'm "exemplary" at Dragons, while the Dungeons could be described as "needs improvement." This is why I tend to collect tools that help me physicalize everyone's choices. The most commonly used items are character minis and foe tokens. The rest depends entirely on the party. For this adventure, we have 7 players, including a Paladin and Cleric, which means that I'll need to create minion heavy fights or combat puzzles/traps to lock down the healers and create a challenge for the group so they don't steamroll every encounter. I'll also need to consult the Out of the Abyss book for any major villains I think they might fight so that I can be on the look out for good miniatures. Beyond the characters and NPC's, I'll also need representations for everything from spell effects to spiritual weapons to flight pedestals. This keeps the whole table honest and aware of the tools at their disposal in a particular space and makes us aware of the cost/benefit of choices we might make. Of course, how you play is totally up to you, but I know with APN's 6 arcane enthusiasts, we are going to have a metamagic soup of chaos. It's with this in mind that I wanted to feature some tools from WizKids that can be super helpful! I love painting miniatures when I'm playing a character. For my druid, I've been collecting and painting all sorts of beasts so that I have options for her favorite forms, but as a GM, I can't spend the time to do this for everyone at the table. These products offer a quick solution that provides Spell Effect miniatures that will bring your magic to life in moments with little effort. One of the best things about these items is that they are pre-made to fit the correct size of the spell effect so its easy to let players place them strategically, but it also means that once they're on the table, everyone is forced to view them as proper obstacles as well. 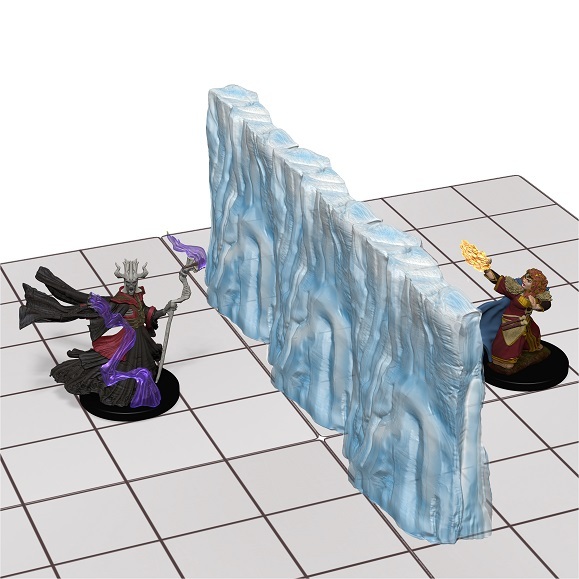 This next set is great because it provides proper representation for commonly used Divine and Arcane spells that take up physical space on the board, whether that's a Bigby's Hand ready to scoop up an important item from a dragon's hoard during combat or a set of Dancing Lights that allows you to properly measure the visible area in a dark cavern. What tools do you stock for your table? Give us your suggestions in the comments!